There are more options for lift tickets and passes for the coming season than ever before. Between passes available from the Aspen Skiing Company, the Mountain Collective Pass, the Ikon Pass and lodging/lift ticket prices from Stay/Aspen/Snowmass, sorting out lift ticket prices is a complicated topic. For this short article, we are focused ONLY on the Senior (ages 65-69) and Silver (age 70+) premier passes available directly from the Aspen Skiing Company. The chart below details the prices. Note that the Senior Pass has a big price incentive if you purchase by September 14; the price goes up by $450 after September 15 and $630 after November 16. 1) Always buy your lift tickets before arriving in Aspen! You’ll pay premium price if you wait and buy your lift ticket in resort. 2) If you are age 70+and plan to ski 5-6 days in Aspen, the Silver Pass is a good buy. Let’s say you are taking our four-day clinic but want to ski a day before the clinic and a day after for a total of 6 days on-snow. $514/6 = $86/day. If you booked lodging in Aspen and bought six days of lift tickets in January, you would pay approximately $109/day for lift tickets. Clearly, in this example, the Silver Pass will save you money. If you’re coming from Australia and plan to ski 12 days of your two week Holiday, you’ll really save money with the Silver Pass. $514/12 = $43 USD/day. That’s a great deal! 3) If you are between the ages of 65-69, you’re going to need to ski a couple of weeks to have the Senior Pass pay off. 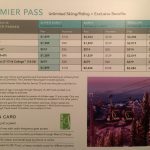 Let’s say you buy the Senior Pass at the early price of $1389 and plan ski in Aspen/Snowmass for two weeks. If you ski 12 days of your two week holiday, you’ll be paying $116/day. If you ski 15 days, the average lift ticket price drops to $93/day which becomes a better value. There is one more Aspen/Snowmass pass to consider and it is a really good deal….with some hurdles. The Aspen/Snowmass Classic Pass has two great options for “Seniors” (65+). Buy a 4-day lift ticket for $219-$55/day, or a 7-day lift ticket for $329 – only $47/day! Wow – that’s a great deal. Both passes allow you to buy additional lift ticket days at 30% off the in-resort rate. But there is a catch! If you don’t currently have a Class Pass, you can only buy it IN PERSON between October 8 – November 18 at one of the four Roaring Fork Valley Aspen/Snowmass Ticket Offices. Once you have a Classic Pass, you can renew on-line. The savings on lift tickets might be worth an off-season trip to Aspen to purchase a Classic Pass! For more information on these Passes, please contact Aspen/Snowmass directly. Their phone number is +1-970-923-1227 or e-mail them at [email protected] Please note we do not sell lift tickets.